“Attention passengers, This is Your Captain Speaking.” A disembodied, calm, authoritative voice, one that is meant to soothe and assuage the fears of those who have placed themselves in its charge – this is This is Your Captain Speaking. There's no better way to put it than that. The sophomore effort from the criminally-underrated band from Melbourne is every bit as sedate and calm as their critically-acclaimed debut, Storyboard, but it manages to set itself apart from this monument to craftsmanship. It seems as if the band is more comfortable in their role – more stately, or more determined, if you will. But the scrupulous attention to detail that characterized the debut is still there, perhaps stronger than ever. There's very little flash, and even less in the glitter department on Eternal Return, but all the special effects in the world won't land the plane when you need them to – they blow stuff up, rather than bringing you home. This is Your Captain Speaking trades the overwhelmingly solipsistic attitude of most instrumental artists plying their trade today for one of communal import. Eternal Return is not a release that draws the listener in upon herself, leading her to meditate only upon listener-as-individual, but instead ushers said individual to her place within her personal "society." This is evident through the album's organization: of five tracks, only two are given titles proper, and these are nestled safely between Parts 1, 3, and 2. This lack of detail gives us reason to place more emphasis upon the two “named” tracks. Between “Incirculation” and “Lullaby”, it is easy to see the thematic connection to a protective social community, itself being shielded by the strength of the “Part” tracks. The content of the tracks backs up the titles' suggestive thematic element with their warm repetition and resistance to the overbearing, melodramatic emotional outbursts of the band's peers. 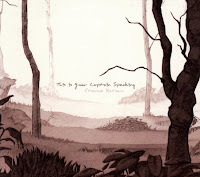 Perhaps most interestingly, This is Your Captain Speaking manages to escape the inherent paradox of community-centered instrumental music (in that it is music that is best appreciated when listened to through some sort of headphone device, obviously severing the listener from the community) through the album's title and development. The title, Eternal Return, along with the band's moniker, suggests that the album is a return from a trip. The listener is not meant to stay within the confines of the album, for that would prevent the return that is promised – we are always, eternally returning, encircled by those we care for and lulled to sleep by their soothing voices. The album allows us to experience this feeling of return twice – once, vicariously through the album's slow, subtle development, and then again once we finish the release, coming out of the vicarious experience and into the actual experience of the friends and family around us. The listener does not only get to enjoy the music itself, but also comes to appreciate her own real-life returns with a greater understanding than would be possible without the experience. I do not need to tell you that an album having this kind of effect on the real-world interactions of its listeners is as rare (and refreshing) as an oasis in the desert. But how does the music actually do all of this? It should not surprise veteran TiYCS listeners that the album revolves around subtle, contemplative repetition of guitar melodies, slowly developing and growing until the track becomes something completely different from where it began. With this sort of methodology, the band recalls ambient music more than the post-rock crowd they are normally lumped together with, and approaching Eternal Return from this perspective is essential to a proper understanding of the work. Make no mistake, though, this is not a completely ambient release – instead, it navigates between the genre and instrumental post-rock, taking what is best of the two genres and bringing them together under the band's incredible eye for detail and thematic power of the release. Nowhere is this more apparent than on the magnificent “Incirculation”. The first impression offered by the track is merely of an average post-rock track without a devastating climax – apparently a let-down. But once the listener begins to spend more time with the album, and the track in particular, the delicate movement of the track becomes apparent. It is linear, though it is driven by repetition, and though there are minor cathartic moments, the real joy of the track comes through the little changes - the tiny, meticulous developments that eventually produce the most momentous changes. Much like Tulsa Drone's (another instrumental outfit that takes many cues from ambient works) exquisite piece, “The Catch”, the only way to understand the piece is through close, focused listening – but once all is laid bare, the effort is undoubtedly worth it.